Government plays many roles in helping Americans pursue their interests and achieve the American Dream. One such role is balancing business regulations to ensure consumer safety while still encouraging entrepreneurship. Unfortunately for Kansas, it takes four and a half weeks (180 full-time hours) to read all business regulations and restrictions. Fortunately, this burden pales in comparison to most other states. Nonetheless, there lies a unique opportunity for Kansas government. Elected leaders can help create better quality goods at cheaper prices by having the fewest business regulations in the nation. Researchers at the Mercatus Center at George Mason University developed a program that measures and analyzes state regulatory text. Certain words and phrases like shall, must, may not, prohibited, and required are targeted as legal constraints and obligations. Researchers found 70,269 Kansas restrictions concentrated in manufacturing, and professional and business services. How can we understand the effect regulations have on the economy? Let’s say a business starts up, creates a product, and receives profit from it. Over time, more entrepreneurs enter the market, creating a similar product but with higher quality and/or lower prices. With competition, the original firm loses market share, and so must either differentiate their product or go out of business. Meanwhile for the consumer, the competition results in a more affordable price and/or a better product. Also, the more startups , the more jobs created, and the more people are encouraged to go into business for themselves. Regulations fundamentally interfere with that market competition. 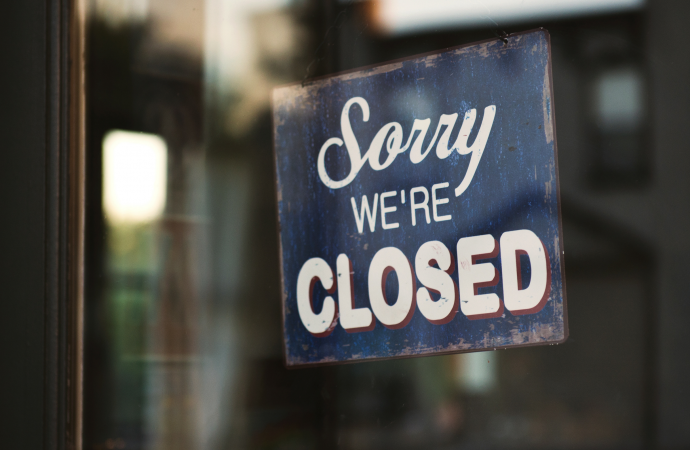 Too much regulation adversely impacts smaller business startups, becoming a larger barrier for their market entry. In turn, larger and older firms don’t have to compete and innovate; keeping prices high and slowing job growth. In the news, there are plenty of examples of regulations tampering with markets and ultimately hurting consumers. Effects range from high prices (Epi-Pen), to lack of available jobs (occupational licensing), to simply keeping out the competition (Facebook). We charted the rate of new jobs in Kansas to better measure the effects of increased regulation on the economy. This data is the net change in jobs from businesses that either start up and grow or shrink and close. So, if a startup creates 10 jobs but another firm shrinks losing 3, Kansas sees a net increase of 7 jobs. A more dynamic economy means more startups, a stronger push for older firms to adapt, and more new jobs. We looked at 2017 – the most recent year available, then went back every ten years to the earliest, 1994. 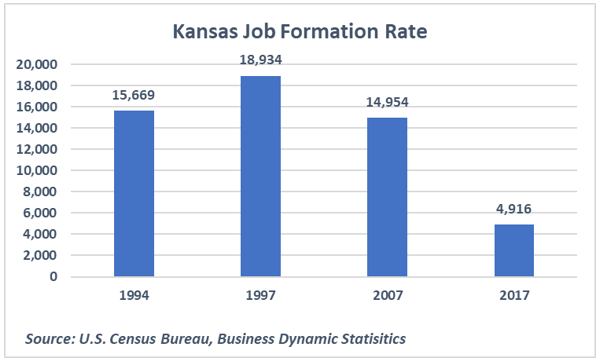 Kansas’s current rate of new jobs is roughly a third of the growth in the 1990s. The Mercatus Center ranked Kansas industries with the most state restrictions. As stated in the beginning, the goal here isn’t to eliminate all regulations. Some industries like chemical and petroleum manufacturing need some rules to limit harmful effects on consumers from their production. However, the high cost of regulations can be passed to consumers in the form of high prices. Therefore, it’s important to know where to draw the line. In the table below we noted industries, their number of restrictions, and their change in consumer prices. Not surprisingly, associated statistics can tell a compelling story. While this doesn’t prove causation, the heavier the burden restrictions place on businesses, the more expensive their consumer products become. For example, professional, scientific, and technical services include lawyers, accountants, doctors, and engineers to name a few. This industry relies heavily on STEM and business education. Yet, it has nearly 4,000 Kansas restrictions. This means potential entrepreneurs in this field must devote roughly 9 hours just to read these regulations one time over. Additionally, startups must follow federal regulations as well. Complying with different layers of restrictions can discourage startup activity. Those that do go into business, will likely raise their prices or cut the quality of their products and services. More expensive or lower quality products/services make Kansas families worse off. Improving the value of goods at cheaper prices is synonymous with faster economic growth and more opportunities for Kansas families. Therefore, simply tinkering with regulations may not be enough. 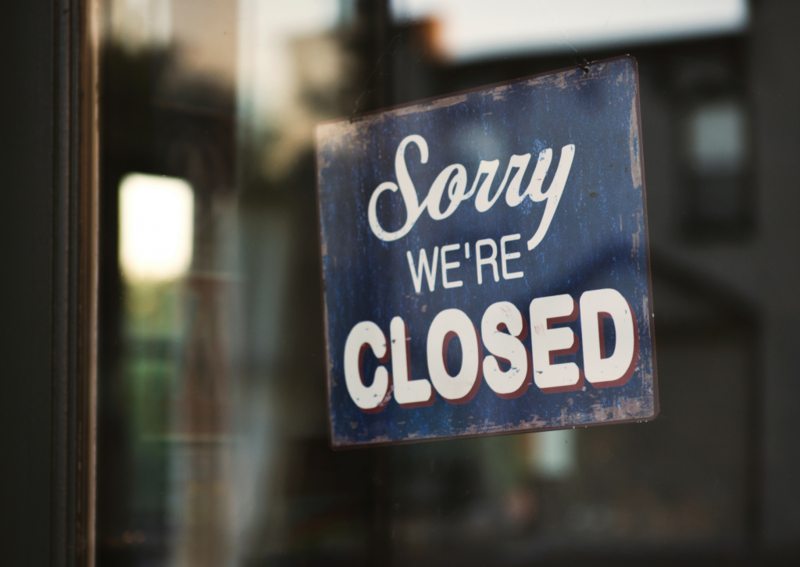 Policymakers should make attempts to substantially reduce its over 70,000 business regulations. A Kansas commission with a purpose like the Texas Sunset Advisory Commission could be the tool to find and reduce burdensome regulation. It may not be easy to cut the number of restrictions in half. However, striving towards such lofty goals would create a significant competitive advantage to lure in and foster economic prosperity for Kansas.